Springer has just published a book on "Experimental Research in Evolutionary Computation", written by Thomas Bartz-Beielstein. Thomas Bartz-Beielstein is working on the statistical analysis of the behaviour of metaheuristics (see its tutorials at GECCO and CEC), and the publication of its book is a really great thing. I haven't read it yet, but the table of content seems really promising. There is a true need for such work in the metaheuristics community, and in stochastic optimization in general. A friend said to me that the lack of experimental culture in the computer science community was a form of consensus, perhaps because theoretical aspects of mathematics was the "only way to make true science". This is a true problem when you deal with stochastic algorithm, applied to real world problem. Despite the fact that several papers early call for more rigourous experimental studies of metaheuristcs (E.D. Taillard has written papers on this problem several years ago, for example), the community does not seems to quickly react. Yet, things are changing, after the series of CEC special sessions on benchmark for metaheuristics, there is more and more papers on how to test stochastic optimization algorithms and outline the results. I think this book is coming timely... the next step will be to promote the dissemination of the results data (and code! ), in an open format, along with the papers. The IEEE Congress on Evolutionary Computation (CEC) is a well-known event that take place every year. 2007, Performance Assessment of Multi-Objective Optimization Algorithms. What is really interesting in these sessions is the systematic presence of an implemented generalistic benchmark, built after discussion between researchers. This is an extremely necessary practice, which is, unfortunately, not generalized. Indeed, this is the first step toward a rigourous performance assessment of metaheuristics (the second one being a true statistical approach, and the third one a considered data presentation). This blog is an attempt to publish thoughts about metaheuristics and to share them with others. Indeed, blogs are fun, blogs are popular, ok... but most of all, blogs can be very usefull for researchers, that constently need to communicate, share ideas and informations. Metaheuristics are (well, that's one definition among others, but in my opinion the better one) iterative (stochastic) algorithms for "hard" optimization. 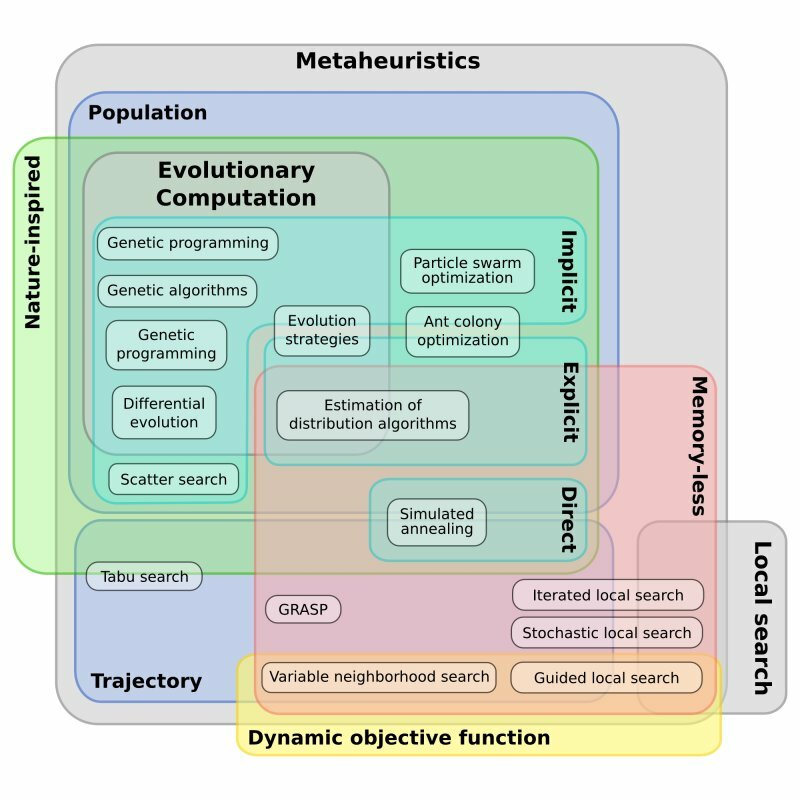 Well known metaheuristics are the so-called "genetic algorithms" (lets call them evolutionary ones), but these are not the only class: dont forget simulated annealing, tabu search, ant colony algorithms, estimation of distribution, etc. This blog will try to focuse on the theory, the design, the understanding, the application, the implementation and the use of metaheuristics. I hope this blog will be profitable to other peoples (researchers as well as users), and will be a place to share thoughts. Welcome aboard, and lets sleep with metaheuristics.